Big fish with sharp teeth require crafty rigs made of bite-resistant wire. A string of plump hardtails — kingfish candy. The basic stinger rig puts a hook at both ends of the bait to prevent short strikes. 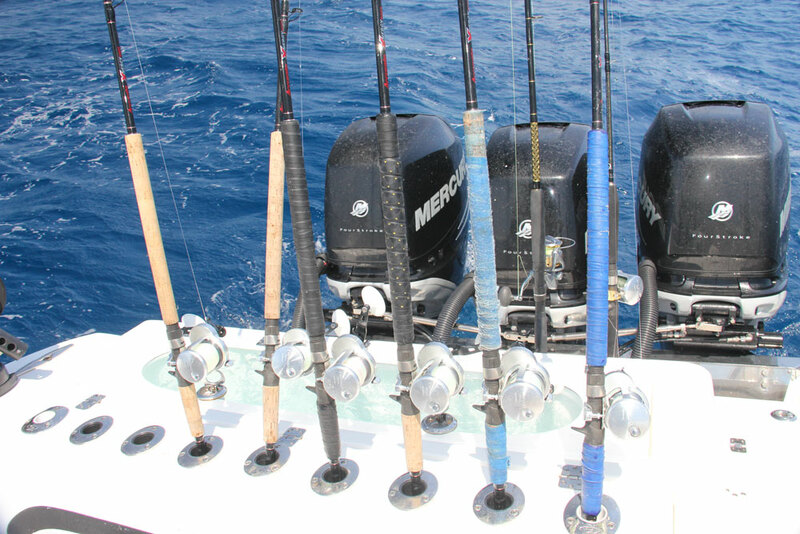 Keeping several rods ready with multiple rig styles allows you to quickly diversify your presentations. 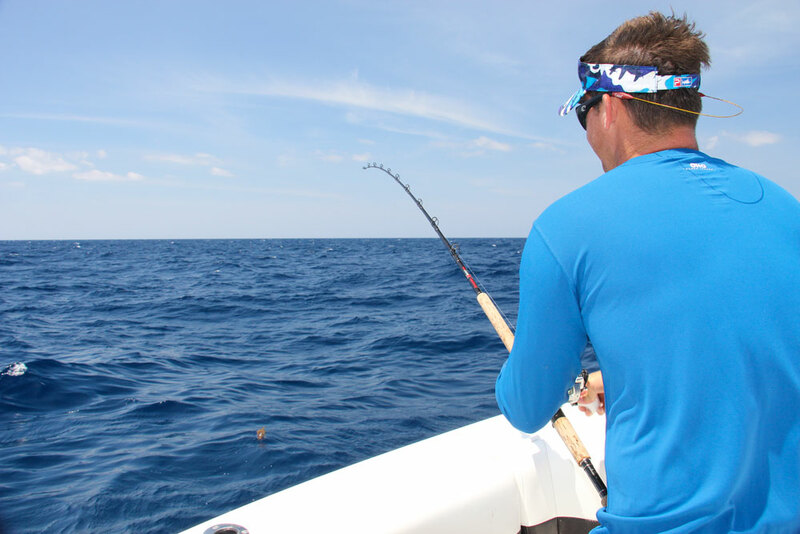 A hooked kingfish is a tricky opponent, so take your time and don’t ever horse it in. 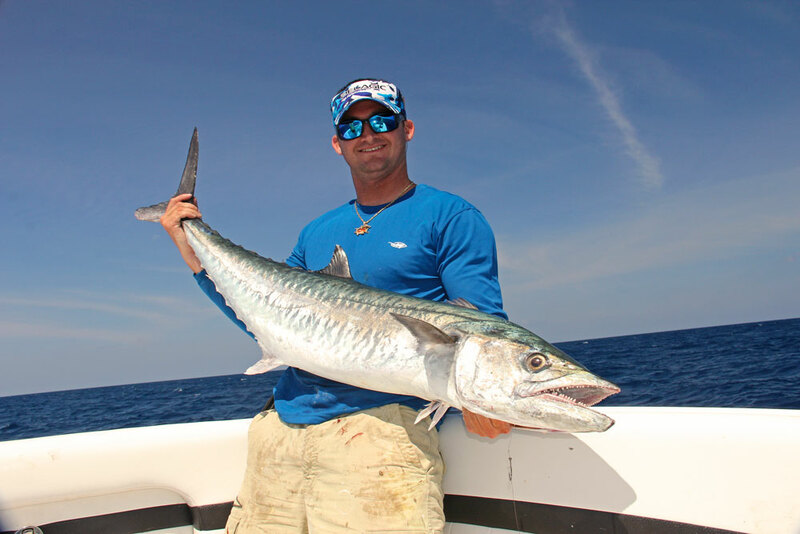 Ruthless aggression is the name of the game for king mackerel — so big baits and wire rigs are key when tackling this toothy predator. Solving both of these problems, savvy anglers employ rigging wire for leaders, and for building the all-important “stinger rig” — a main hook trailing a treble “stinger” on a short piece of wire. This arrangement not only repels those wicked choppers, but it also ensures the king gets snared no matter how it bites. Now there are definitely tastier fish in the Northern Gulf, with tuna, cobia, snapper and speckled trout all coming to mind. So, why go to the trouble of trying to outmaneuver such a headache-maker? Well, why did people pay big money to see Mike Tyson fights they knew wouldn’t last one full round? Ruthless aggression — since the days of Rome’s gladiators, ruthless aggression has always been a marketable commodity. And if ever there was a fish that truly does not care; it’s the kingfish. “Reckless abandon” simply doesn’t do them justice. No, this is full-throttle, vicious savagery in its truest form. So, you want a front row seat to the bite show? Butler and Jackson shared their insights on the key areas of baits, rigging and fishing strategy. This one’s as straightforward as it gets: Big, fresh, live baits are the surest path to giant kings. Troll plugs, spoons or rigged ballyhoo and you’ll catch all the little ones you can stand, but when 50-plus-pounders are there for the taking, why burn daylight on the riffraff? 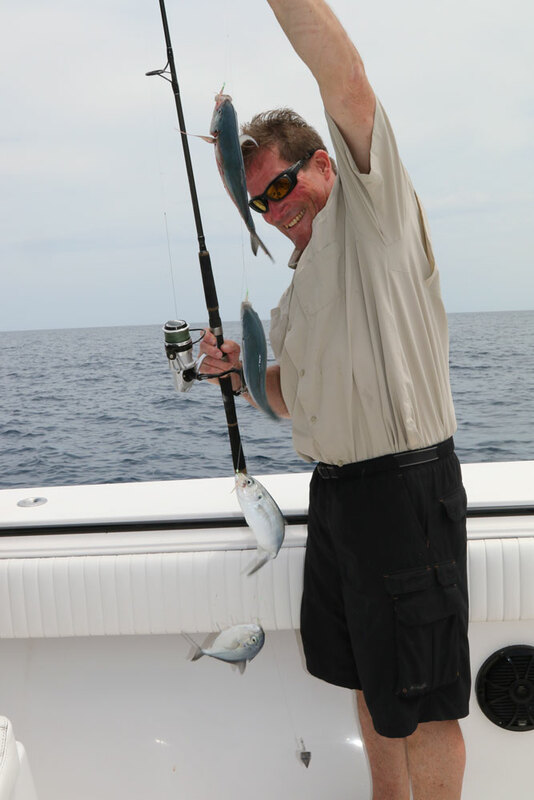 Butler’s fond of big hardtails (blue runners), bluefish and big greenies (threadfin herring). Jackson seconds that opinion, and adds in bonita and pogies. Pogies are almost exclusively a cast net deal, but anglers often use sabiki rigs — strings of gold hooks on dropper loops with a weight at the bottom — to nab hardtails and greenies. 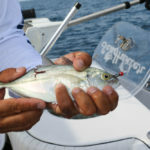 When Butler’s looking for whopper hardtails or bluefish, he’ll fish a double shad rig (lead heads with plastic shad tails). Whatever the bait, both anglers know that their only hope of boating a giant fish with scissors for jaws is to rig up with stout wire “stinger” rigs. Essentially, a lead single hook set through the nose or forehead of a live bait trails a treble hook on a piece of wire hanging from the bend or the eye of the lead hook. By positioning the firepower at both ends of the bait, a stinger rig greatly improves your chances of snaring whatever bites. Wire is also necessary for leaders, as a big king’s choppers occasionally reach past the bait. Butler says he’s not interested in wasting time with smaller fish, so he snells his lead hooks and trailing stingers directly onto his 90- to 130-pound, 7-strand wire leaders. “I’m not a believer in small wire,” Butler said. “These are predator fish; they’d eat a shoe, so when he hits, we’ll catch him. You go through so many 40-pound cookie cutter fish to get a big one and you don’t want to spend 30 minutes on every fish. Dead ribbonfish, aka “silver eels,” make dandy big king baits, but you have to manage that lanky profile with a specialized rig. Replace the standard lead hook with a narrow jig and enough sequential stinger segments to cover the size of the eels you’re trolling. 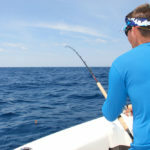 Set the jig through an eel’s jaws (bottom-to-top) to keep the mouth closed while trolling and pin those stingers along the flank with enough slack to allow a swimming motion. For extra enticement, try a “double-trouble” rig with two live hardtails, greenies or pogies staggered on a pair of stinger segments. The baits fighting against one another create a cluster of activity that big kings can’t resist. Another creative option originating in the Carolinas is the Zombie rig. This one positions a rigged ribbonfish on a wire leader trailing a stinger-rigged live hardtail. The appearance of a predator keeps the hardtail struggling to flee, while the whole drama looks like easy pickings to opportunistic kings. Yet another tip for attracting attention involves accessorizing your rigs. Skirts, aka “dusters,” comprise a metal sleeve surrounded by strands of Mylar or other flashy material that pulse and flair in the water. 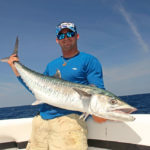 Slipping a duster or simply a colored bead onto your leader can help kings locate your bait when overcast days or rough water impair visibility. Slow trolling a spread of baits around emergent or cut-off rigs is the main deal for big fish. Jackson said he’s looking for that pretty “king green” color that’s not crystal clear, but not too dingy. From his experience, returning to the site of past success is usually a good move. Marking baitfish on the sonar always bodes well, but Butler’s also watching for topside clues. 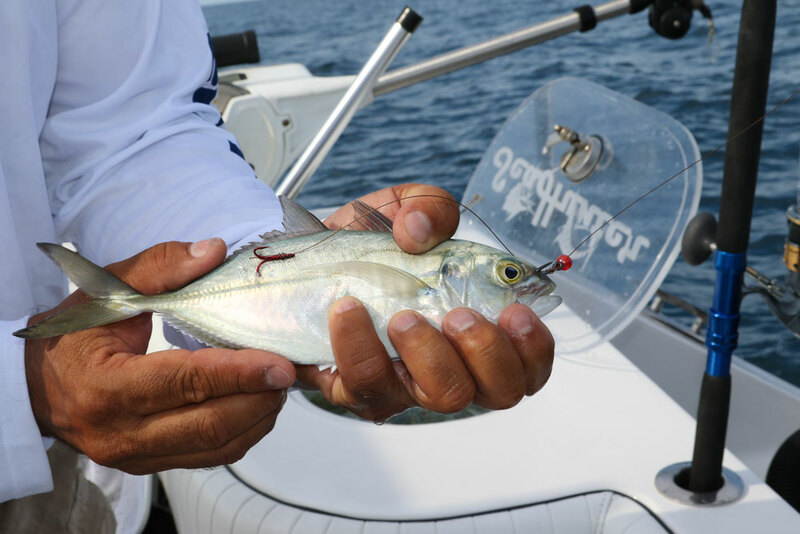 Specifically, baitfish behavior will tell you a lot about the kind of day they’re having. 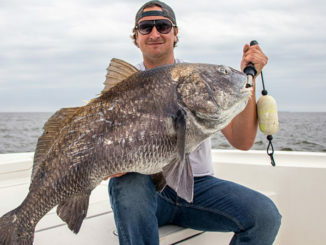 “When you see those big schools of hardtails spread out, they’re relaxed, but when you see them tucked tight to the rig, that means something’s eating them,” he said. You might think that slow trolling live baits around a massive existing food source would be futile, but it’s just the opposite. Terrified baits huddle close, so when yours come sauntering by the outskirts, that vulnerability flips the king’s feeding switch. Rough weather may curtail how many lines you can fish, but when conditions allow, Jackson wants a half dozen baits in the water. First, he’ll deploy big baits, often those ribbonfish, on two downriggers. He’ll stagger the depths with one about 30 feet off the bottom and the other at mid water column. On top, he’ll set four flats at progressively shorter lengths. First is the longest, and this “shotgun” bait goes back about 80 feet. He’ll set a mid-range bait at 50, add another at 25 and then drop one right behind the boat in the turbulent prop wash.
That prop bait often produces memorable moments — suffice it to say that 5 feet of silver missile launching maybe a rod-length off the transom is better than dark-and-bold coffee. 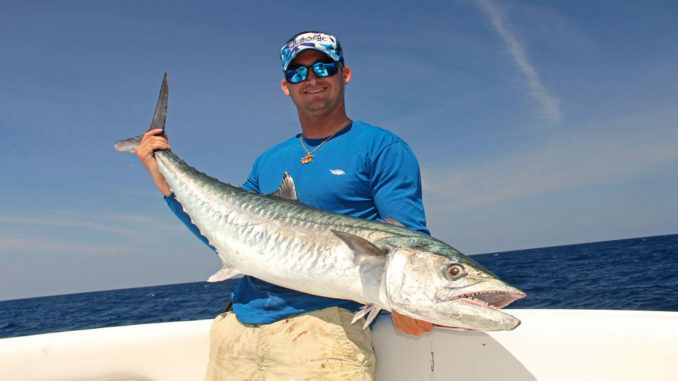 Butler’s trick: Tow a large, dead Spanish mackerel on the long shotgun line. Kings love munching on their smaller cousins, so giving them an easy opportunity often pays big dividends. Tip: When setting a downrigger bait, anglers often twist the line before putting it in the release clip to create a loop for the clip to grip. Do yourself a favor and don’t wrap the line around your finger while forming the loop because big kings won’t hesitate to grab a bait mere feet from the boat — and if a smoker hits the jets with line spun around your finger, you’ll likely have a much less impressive handshake. When your presentations convince a big king to chew, it’s gonna be fierce and it’s gonna be fast. Expect a couple of monster runs and lots of trickery near the boat, so crew cooperation is critical. One man on the wheel, one on the rod and everyone else clears the spread to avoid tangles. Now, if there’s one step in the big king process that’ll make you look silly, it’s the gaffing. No telling how many tournaments were lost or how many friendships broken with a last-second mistake that inadvertently bumped the line and freed a nearly-caught whopper. Once a king starts running out of gas, it will make big death circles by the boat, similar to a tuna. 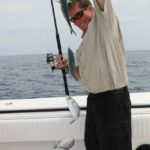 On the rod, you want to gradually steer the fish higher in the water column as each pass heads away from you. When the circle comes back around, reel down to gather line and keep the fish heading upward. Once the fish surfaces, lay the gaff across the back — always behind the line — and smoothly pull it into the fish. Controlled movements win; frantic stabbing — not so much. In and out of the water, the king’s teeth are some of the sea’s most formidable. Don’t underestimate the biting power of a big fish and keep your fingers well away from the business end. Long-handled hook pluckers will keep you out of harm’s way. 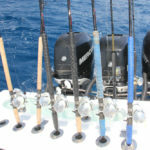 A full-time freelance writer specializing in sport fishing, David A. Brown splits his time between journalism and marketing communications.